Background/Purpose: Calcium deposition diseases, the disordered calcification of cartilage and/or periarticular soft tissue, are associated with aging, degenerative joint disease, and genetic and metabolic disorders. These conditions are often diagnosed by plain radiography; however, definitive diagnosis requires synovial fluid analysis. Recently Ultrasonography has emerged as a very useful tool for assessment of musculoskeletal disorders. This study was planned to assess the performance of Ultrasonography to detect calcium crystal deposits, as compared to Radiography and Crystal examination, in primary osteoarthritis patients. Methods: Twenty consecutive primary osteoarthritis patients, who fulfilled ACR criteria for knee osteoarthritis, were enrolled from the rheumatology out patient department of a tertiary care centre. Radiological and sonographic assessment was performed to assess the extent and severity of joint involvement. Presence of crystals in synovial fluid were evaluated by polarized microscope. For the purpose of reproducibility and objectivity in USG findings, the evidence of calcium deposits was taken as presence of chondrocalcinosis of femoral condylar cartilage or meniscal deposits of calcium. Results: Eight patients were males 12 were females. Average age of patients was 62.6 years. Average duration of illness was 5.5 years. Total 40 knee joints were assessed. Evidence of calcium deposit was seen in radiographs of 11 knee joints (only condrocalcinosis in 5, only meniscus calcification in 4 and both in 2), while USG detected calcification in 35 knee joints (only condrocalcinosis in 2, only meniscal calcification in 12 and both in 21) [p=<0.0005]. The synovial fluid examination revealed Calcium crystals in 16 patients (CPPD in 14 and BCP in 2 patients). The difference between USG analysis and Synovial fluid analysis was not statistically significant. Figure 1. USG images showing A. Chondrocalcinosis in femoral condyle and B. Calcium deposits in Medial meniscus. Conclusion: Ultrasonography has high sensitivity and specificity for detection of calcium crystal deposits. It is a better modality than plain or digital radiographs, and it appears more sensitive than Synovial fluid crystal examination. However larger studies are needed to be carried out to establish its accurate efficacy. Disclosure: S. K. Das, None; D. Srivastava, None; U. Dhakad, None; M. Singh, None; R. Srivastava, None; A. Wakhlu, None. Das SK, Srivastava D, Dhakad U, Singh M, Srivastava R, Wakhlu A. 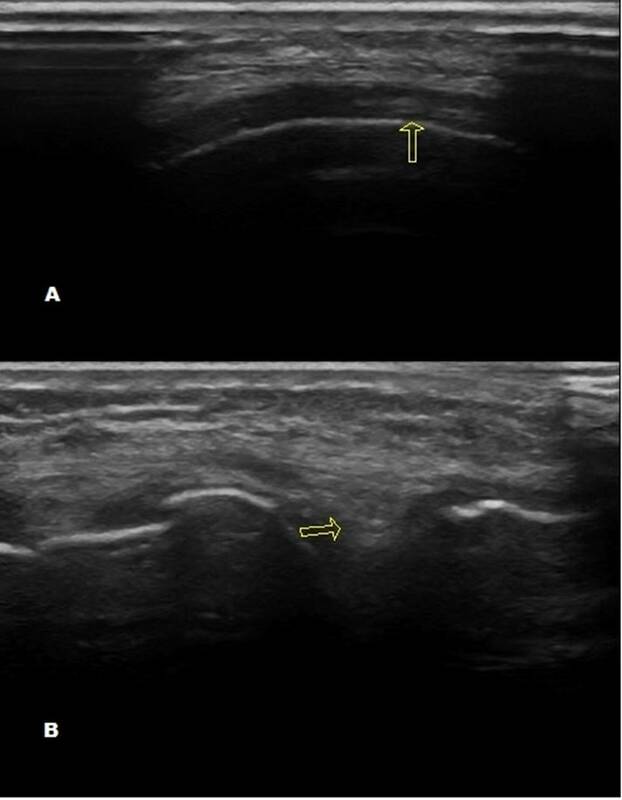 Evaluation of Ultrasonography As Modality for Identification of Calcium Crystal Deposits in Patients of Primary Osteoarthritis of Knee Joint [abstract]. Arthritis Rheumatol. 2016; 68 (suppl 10). https://acrabstracts.org/abstract/evaluation-of-ultrasonography-as-modality-for-identification-of-calcium-crystal-deposits-in-patients-of-primary-osteoarthritis-of-knee-joint/. Accessed April 21, 2019.